Travel lore says that the Pamir Highway which winds through mountains in Tajikistan utterly beautiful and by all accounts, not to be missed. There is also a southern road which hugs the banks of the Pyanj river that many travelers rave about. But this is no new road and it has witnessed many a traveller. There have been kingdoms and settlements along the Pyanj going back to the third century BC, likely even earlier. Some ruins still stand at different spots along this stretch. I wanted to see them all and take my time to travel this road. The hunt for others began once more so I could share a car. And so began another round of badgering travelers and accosting total strangers on the streets. 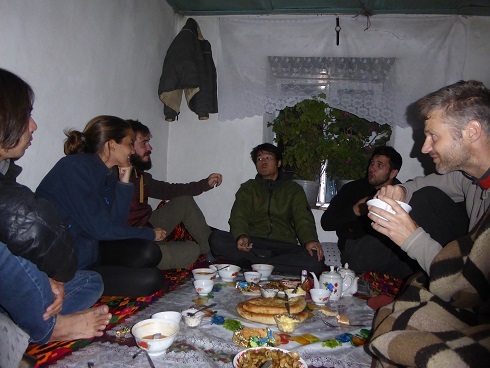 In a small eatery in the Khorog bazaar I found others who were keen on a multi-day trip as well. Our motley crowd consisted of Jorg and Daniel from Switzerland, Seijiro from Japan and myself. Starting early today we made a brief stop at the military checkpoint at the border in Ishkashim so I could deliver a parcel to the Afghan villagers. Another stop was called for in the village to eat piping hot peroshkys and we were on our way to Bibi Fatima. But there is a lot to see in this area and we intended to stop frequently. This region has had a harsh winter with more than the usual amount of snow followed by an unusually warm summer. There is more snowmelt than the river can handle and in several places the river has burst its banks. There are roads and bridges that have been washed away and homes that are under water. We jolted and rattled over dirt roads and sloshed over parts where the river rose over the road. Not the greatest to begin with, this road is made worse because of the flooding. But we did not have to get out and push the car, we joked. Ibrohim, our driver told us that we had many hundreds of kilometers to go yet – and that it may well come to it, he admonished. The road on the Tajik side hugs the right bank of the Pyanj and just across the river is Afghanistan. I was glued to the window as fixated as before, perhaps even more so, this time trying to pinpoint the landmarks and villages I had be in just a few days ago. Along the road are villages – a tiny spot of green in the dry arid surroundings. Like the Afghan villages on the other side of the river, these too are mostly farms with a few herds of cattle and sheep. But unlike the villages across the river, the standard of life is higher here, the people not nearly as destitute. There are more houses built of cement, quite a few more cars and trucks on the road. School and government buildings made regular appearances as did clinics and pharmacies, however rudimentary. It is incredible to see the difference between the two sides of just one river! And not even a very big river at that. We stopped often, to take photographs, to drink in the view. Soon after Ishkashim we stopped at some ruins. The barely discernable, much-eroded walls was the remains of an old fortress whose origins go back to the third century BC. Not much is left of the Khaakha fort except partial mud walls and battlements but it commands a wide view of the surroundings, especially a 180 degree vista across the river. It is little wonder that this site has been an important strategic post throughout history up until very recently. There are gun placements and a now abandoned building bears graffiti in Cyrillic. The mazar or shrine at the village of Darshai is topped with with large ibex horns in the traditional manner of Ishmailis and features prominently in tourist brochures. But far more interesting was walking down the village street and being invited into the garden of a local house, enclosed by high mud walls. We peered over the wall and the woman working on her garden with her daughter promptly invited us to tea. Such is the spontaneous hospitality of the Pamiris. We declined but happily took up her offer to pluck fruits off the trees. To the refrain of “bokhor, bokhor” we gorged on fruits. Not quite fully ripe, I found the tart taste of apricots and plums delicious. A brief stop to buy some food entailed trooping into the kitchen and miming what we wanted. The villages are clustered quite close together in some places and strung out in others along this bank. Close to the village of Tuggoz, the mountain side rises steeply and the road follows some six or seven kilometers of switchbacks. At the top, at the edge of a cliff, at about three thousand meters above sea level sits another fortress. The Yamchun fort dating from the twelfth century AD, is a relative newcomer in this valley and is the best preserved of all the ancient castles, forts and cities that dot the landscape. With its round towers and much of the walls still standing, it commands an amazing view up and down the valley. As the sun dips and shadows lengthen, I sit on a stone amid the ruins and gaze at the peaks of the Pamirs. Far below, the village of Khandut lies on the Afghan side across the river and looking up the valley I can see the many strands of the river glinting in the sun. The clouds part now and then and I can glimpse the loftier snow-laden peaks of the Hindu Kush behind the Pamirs. Ah, the Hindu Kush! The stuff of legends. I remember stories first read long ago and imagine the sights and sounds through the ages. There is a lot of thermal activity in this part of the world and the Pamirs are riddled with hot springs. I had already visited the one at Garam Chashma, closer to Ishkashim but word is that one of the best ones lay a kilometer or so further up this road. A popular destination for locals, the Bibi Fatima hot springs have mushroomed into a tiny village with a few hotels and homestays offering beds and food at varying levels of comfort and price. Occasional spider webs and bedbugs are offered at no extra cost. Some establishments can only offer a communal toilet, the kind that is popularly known as a “Nie Hao” toilet in traveler lore. Holes cut in the wooden plank covering the floor do not necessarily mean they are used. Or perhaps some folks simply lack the ability to aim correctly. These are ubiquitious in China and so called because of the lack of partitions between neighbouring holes. Who could argue with a companionable chat while taking care of necessary functions? The hot spring itself emerges from the mountain side and around it a couple of huts have been built. There are separate rooms for women and men. In the women’s enclosure, the hot water collects in a knee high cement pool. A pipe extending from the wall provides the inlet for hot water. The mineral content has made the walls lumpy with calcification, the colours of blue and green give some indication of the mineral content. There are five or six women in the pool at any one time. They smile at me as I step in gingerly into the too-hot water and continue chatting as they scrub each other’s backs. Today has been a long day and we were only too happy to find beds in one of the guesthouses. Our meal of soup and naan bread was just shy of delicious after being liberally doused with the cayenne pepper that I have taken to carrying around in my bag. ‘Tis the only way I can survive Central Asian food. Inhospitable though it appears, this part of the world has seen the rise and fall of many a kingdom and witnessed the ebb and flow of many a religion. In the heydays of the Silk Road, it was Buddhism that held sway all along this valley. From near the Shiva lake in present day Afghanistan all the way to India and into Tibet along the valleys were paths and on them plodded pilgrims, travelling many a year sometimes. And in many of the places that we are driving through there existed resting places for the weary. Here and there grew monasteries and as we drove, I saw caves dotting the mountain sides – meditation caves from the days of yore. The monasteries that dotted this area have long since crumbled but some ruins still exist. Near the village of Vrang lies the remains of a Buddhist stupa. Only the stepped sides remain now, perched high above the village. Surrounding it are remains of a once large, likely monastic building. The foundations of separate rooms are still clearly visible. I wonder if the Chinese monk Shuan Zhang stayed here on his epic seventeen year long journey in the seventh century. Or if this monastery existed when his predecessor travelled through here even earlier. Both left detailed written accounts of their journeys – I’ll have to do some digging when I have the time. Further east on the north bank of the Pyanj lies the crumbling remains of yet another fort simply called Zong. In Tibetan, the word “dzong” means fort. I wonder at the etymology of this word. Others more erudite than I, will no doubt know. Something else to find out when I am back. The crumbling tower and walls are silhouetted against the sun at the bend in the river with clear views up and down the river for miles. The villages have become smaller and smaller as we go further up the valley. The homestays have become more basic as has the food. Sagging bedsprings are complimentary and I incur slightly baffled looks when I opt for the floor. Requesting hot water in the shower sometimes comes with a mild shock, thanks to the electrical wires used to heat the inlet pipe. It is no doubt designed to wake one up properly – just another feature of the hospitable kindness. But the openness and friendliness of the Pamiris has become better and better. We get smiles and waves and shouted greetings from adults and children alike as we drive. At the village of Langar, we were treated to an impromptu concert when the owner, Yodgar strapped on his accordian and a friend of his started on the drums. The dancing followed soon and we joined in with gusto. Not the easiest to do when one is at high altitude! Literally breathless I had to stop soon – not quite the late-into-the-night jig they were hoping for. My lack of Bollywood-esque moves helped temper their disappointment. Langar has another attraction. The cliffs above the village is littered with boulders and many of these bear carvings from ancient times. We spent an afternoon scrambling around the mountain looking for these petroglyphs. Old images of ibex, cattle and human figures are overlaid by more recent graffiti in Cyrillic and Arabic. I recognized an old script from a book by Charles Allen read a while ago; it is similar to Prakrit, based on Sogdian. Judging by the number of coupled names, some adorned with hearts and flowers, this is an obvious ritual among young lovers in the area. And quaint in the way only one initial is used for each name. At Langar we left the Pyanj and veered north west, following the bank of the smaller Pamir river. We were headed to the village of Bulun Kul, high in the Pamirs at 3800 meters above sea level. The bad road had become worse but ibrohim tells us that there is even worse to come. Soon we left the Pamir river as well and headed north. The road rose steadily climbing to the Khargush pass at 4344 m.
The young sentries at the checkpost see many travellers who come by but are baffled as to why on earth we do so! Ah, but this is wanderlust, I tried to explain. He just shook his head, clearly thinking we were certifiable. He was happy to accept some cookies, candies and cigarettes. This is hardship duty for them and one of them spoke of his home in Dushanbe longingly. I can sort of understand their feeling. This is a desolate landscape – the few pockets of green have disappeared as have the villages. Looming brown-beige mountains surround us, hemming us into deep ravines. Far below the thin ribbon of the river glints as it winds through the ravine. Stones skitter out from under the tires and go spiralling into the waters. Sometimes a lone eagle soars overhead. A few marmots venture out of their burrows and peer at the passing car inquisitively. Sometimes a trio of them sit up on their hinds legs chattering – calling out rude names in marmotese no doubt. But there is a startling beauty to the landscape – it reminds me of parts of Ladakh and western Tibet that are some of my favourite haunts. I have no need to look at my watch to check the altitude – we must be at 4000 m or higher; I have that giddy happy feeling that I get at these altitudes and amidst this stark beauty. There are those that tell me that it is merely the lack of oxygen that produces this giddy high. Perhaps. But then again, perhaps not. Soon after we saw a lake sparkling in the distance and skirting it, reached the village of Bulunkul. Set in a wide open plain with dust devils rising around it from time to time, the village looks surreal. A handful of buildings made of mudbricks but plastered and painted white cluster together. Hemmed in by lakes that shine turquoise and green, they look up at peaks draped with glaciers several hundred meters long. Tire tracks mingle with those made by the goats and sheep. Smoke curls from a few of the chimneys. A gaggle of children run out waving as we drive up. One of the local women, Munira led me to her friend Anurbeg and we decided to stay in her house. Built in the same manner as the others, there are just two rooms in the house. A raised platform in the larger room is spread with a table cloth come mealtimes and we sit cross legged around it, sprawling back on the cushions periodically. At night we take the mattresses and blankets piled in one corner and make beds in the same space. I, as the lone woman in our group had the dubious luxury of a mattress on the floor of the adjacent outer room. The combination of curiosity and friendliness and very different concepts of privacy of the villagers, especially the children, meant we got used to anyone and everyone just opening the door and walking in. I learned to change clothes in record time. 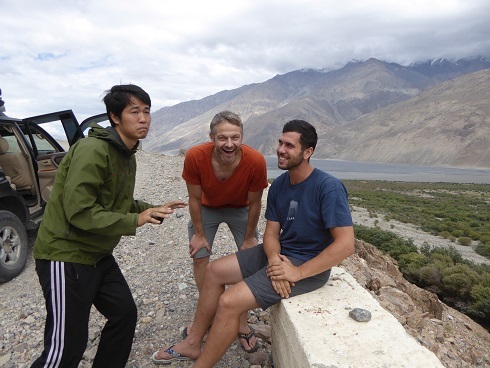 Travel along in the Pamirs meant we were all on the same road, leapfrogging each other. Every so often saw the same travelers that we had met in other places and erupted with delighted greetings. We exchanged news over meals and chai. And there were those we wanted to avoid but they turned with annoying regularity. Word had reached Bulunkul of our dancing the night before and I soon found that there was an accomplished guitar-playing singer in the village. A couple of other men had the round drum, similar to the Iranian daf, but held and played differently. A scant half hour later it was all set. There is to be a concert tonight. Some spare petrol has been scavenged to fuel the generator in the clubhouse and all are invited. Squished in like sardines in the one room clubhouse we were treated to this impromptu live concert. The songs alternated between haunting strains of Tajik ballads and the rousing beat of Pamiri songs that set your foot tapping. We danced, mimicking the movements of the more accomplished dancers of the village. Many of the local young women acted coy but the men needed hardly any cajoling. They may be able to spin and stomp non-stop but I needed to sit out every other dance. Dancing is hard work at this altitude! There is a rumour floating around that a yak is to be slaughtered today. At breakfast we heard that one is being brought in from a neighbouring village. Sitting on the sidelines of a volleyball game, I met the director of the local school. She confirmed the rumour as she gave me a tour of the schoolhouse. It is her family that is going to slaughter the animal. From time to time, she explained, a family will slaughter an animal. This is preceded by prayers for the family’s well being and then the meat is distributed to all the households in the village. I recall similar rituals in Tibet – a pragmatic ritual that does double duty in gaining good karma. Does the concept of karma exist here as well? Armed with a pair of binoculars, someone had been keeping watch on the trail. Yes! There are the yaks being led around the far ridge toward the village. But they are not led directly into the village; they have to be “caught” first. There must have been a time when the men had to catch a wild yak but those days are long gone. All that remains now is the ritual. As the yaks reached the patchy meadow next to the village, out streamed a group of thirty or so men, whooping and hollering. They were intent on the white one, the smaller of the two yaks. Enmasse they moved toward the animal and yak turned tail and set off at a trot toward the distant hills. One of the drivers had to drive up one of the cars to head it off. Amid a lot of shouting and whooping, handwoven lassos were thrown over the yak. Eventually after some fifteen minutes, it was caught. A noose was around the neck and a rope tied to one of its fore legs. It was then pulled, pushed and prodded into the village, the men walking alongside chanting jubilantly. Brought into the village, it was held in place while the prayers were completed. The living room, kitchen and steps outside the house were crowded with men sitting and squatting. Many spilled out on the road outside. Holding out open palms cupped in prayer, they listened to the drone of prayer from inside and chorused from time to time. It was curious that all the men in the village as well as the outsiders could participate in the prayer, but the only women were those of the household. Some of the younger men, gleefully helped by the boys had been holding the yak in place. Panic had its eyes rolling and the harsh sound of its breathing nearly drowned out the drone of prayers. I couldn’t watch anymore and left for a walk. The animal had been slaughtered by the time I got back, the blood drained in the halal way I was told. I had heard no bellow or cry. Butchering was in progress as five or six men wielding sharp knives carefully cut away the skin and proceeded to cut out each organ. As each organ and the meat was cut out, it was carted away into the house, to be cut into smaller pieces and distributed. The whole process took some two or three hours and was skillfully done. There is no wastage here – every part of the animal will be used, from its skin to its intestines. The school director came by later that evening to give me a plastic pouch with more meat than the four of us could possibly eat! We gave Anurbeg most of it but she cooked up some of it for us – fried with onions and garlic, it was delicious! I barely needed my stash of cayenne. We had visited the lakes of Yashil Kul and the couple of hot springs in the area the day before and were ready to leave. The plan is to stay somewhere between Bulunkul and Murghab tonight. Driving east, we are now on the Pamir Highway or M41. The occasional enforced stops for repairs were more welcomed by the passengers than the drivers. It had become a standing joke that some were suspected of resorting to sabotage to be able to get out and stretch our legs. The same arid landscapes in the same dusty tones lie before us but there are some patches of green here and there. Sometimes in the distance, at the foot of some ridges there are larger patches. And there are tiny white dots – yurts! We are heading into the area where there are more Kyrgyz than Tajiks and a way of life that different from the Pamirs. The altitude is lower than places we have been in recentl;y but still above 3000 m.
A stop at the village of Alichur for chai was enough to tell us we did not want to stop there for the night. We decided to drive on. Ibrohim tried valiantly to convince us that we could be in Murghab soon – he had pals there and all these wanderings in the back of beyond was clearly not his cup of tea. His protests fell on deaf ears though and we stopped at a yurt by the side of the road, barely thirty kilometers out of Alichur. This is an area populated largely by ethnic Kyrgyz, although they have lived in Tajikistan for more than a few generations. They speak not a word of Tajik; some even tell me that they do not wish to speak it. I have been blithely butchering Tajik, Farsi and Dari the past month and a half and found myself struggling to remember the little Kyrgyz I’d used before. Linguistic multitasking is apparently not my forte! Language issues notwithstanding, we were made welcome and the family was happy to have us sleep in the yurt. Here as in other parts of Kyrgyzstan, there aren’t any true nomads anymore. A couple of families go up in the high pastures each summer, taking with them, the sheep, goats and yaks of other families. And bring them down at the end of summer. But these two families are not quite doing the same. They come to this pasture each summer and the herds are their own. Come winter, they hire someone to look after the animals and move to Alichur. The younger children go to school there and their oldest daughter, Tashilhan returns to the university in Bishkek where she is studying English. She doesn’t much care for Tajikistan and would prefer to live in Kyryzstan. The younger children aren’t too sure what “Kyrgyzstan” really entails. The nine year old, Habiba firmly believes that school is simply a waste of time when she could be doing so much else. She is certain she can handle all the animals and the milking if only the adults would agree. Grown-ups can be so aggravating, she says with a toss of her head. Rashid, at seven cannot be bothered with any of that. He has mischief in his eyes and is constantly in trouble. He has been terrorizing the others kids with tales of HUGE fish in the shallow ponds and dips that form with the rains. We went to look – I was to be arbiter. We found fish, it is true, barely longer than a centimeter. The next order of business was a naval battle, the boats made of paper from my rapidly dwindling notebook. The captain, aka Rashid fell into the knee-deep water in his excitement. In soaking wet clothes but still cackling gleefully, the captain was hauled off inside. The troops were called in as well and I wandered off to watch the yaks being milked. I already knew from past experience that I am no good at this and kept a respectful distance. From Alichur to Murghab is a short drive but we had added two more passengers to our car. Tashilhan and her father were packed in with us, heading to Murghab. Tashilhan had complained of stomach pains and on further questioning it turned out that she had had them on and off for almost two years! But had not gone to the doctor because she was afraid. It could be that she, and the family were afraid to visit doctors but it could be that they were simply afraid of the cost. The combined persuasion by our group helped convince her parents that a visit to the hospital was necessary. I agreed to accompany her at her request. The echoing cavernous building with a few lab-coated figures wandering around in the hallways was marginally better than I had expected. The others had decided to wait as well and soon we had the diagnosis. It was gastritis and nothing more dire than that. The prescription was duly filled at the pharmacy and Tashilhan was given a shot and instructions. Relieved to know she would be alright, Tashilhan broke into a watery smile. I was happy to pay for the services but could not help wondering if this was the norm. Do all others also have this resistance to seeking medical help? How long do they resist? How serious are the cases when – or if – they eventually seek help? This is such a wonderful part of the world – I hope you are or are going to enjoy it as much as I did.